Q.1) Gopal ranks sixteenth from the top and eighteenth from the bottom. How many students are there in a class? Q.2) Five person A, B, C, D and E are standing in a line according to their heights. C is taller than D and E. B is shorter than only one person. Then who is the tallest person standing in a line? Q.3) In a class of 50 students, Jayanthi ranks thirteenth from the top, then what is her rank from the bottom? Q.4) In a row, Mani is 15th from the left end and Rajiv is 9th from the right end. What is Rajiv’s rank from the left end of the row, if there are 4 students’ sits between Mani and Rajiv? from the right end, then what is karthi’s position from the left end? Q.6) In a row of boys, Kevin is 20th from the right end and Daniel is 15th from the left end. When Kevin and Daniel interchange their positions, Kevin will be 25th from the right end. Which of the following will be Daniel’s position from the left end (after interchanging)? Q.7) In a row of boys, Sundar is 11th from the left end and Mohan is 31st from the right end. Karthi is 15th to the right of Sundar and 4th to the left of Mohan. How many boys are there in the row? Among five friends Kavitha, Raju, Selva, Neeraj and divya scored different marks. Neeraj scored more marks than only Divya and Raju. Selva scored more than Neeraj, but not scored highest mark. The one who scored second highest got 85 mark. Q.8) If Divya got the lowest mark, then who got the second last mark? Q.9) If the average score of Selva and Divya is 60, then Divya got how much mark? Q.10) If Divya scored more than only one person and got 75 marks, then Neeraj scored how much marks? Six friends A, B, C, D, E and F are arranged according to their Weights. B is heavier than A but lighter than C. D is heavier than F but lighter than E.F is heavier than C, whose weight is 50 kg. The one who is second heaviest is 60 kg. Q.11) What is the possible weight of the person who is heavier than D? Q.12) What may be the weight of F? Among five friends Raja, Kani, Shanmu, Priya and Renu and they are arranged according to their heights. Kani is shorter than only three person. Shanmu is taller than Raja but shorter than Priya. Shanmu is shorter than only one person. Q.13) Who is taller than Kani but shorter than Shanmu? Q.14) If Kani is shorter than Raja, then who among the following is the shortest? Q.15) If one more person Radha joined in that group, who is taller than Renu, then who among the following person is second shortest? 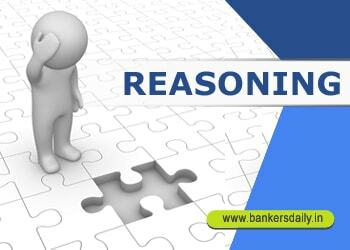 Q.16) Ashok ranked 22nd from the top and 34th from the bottom among these who passed an examination. Eight person did not participate in the examination and five failed in it. How many boys were there in the class? Q.17) P and Q are ranked ninth and 13th respectively from the top in a class of 43 students. What will be their respective ranks from the bottom in the class? Q.18) Nikitha’s ranks 13th in a class. Sivu is 17th from the last. 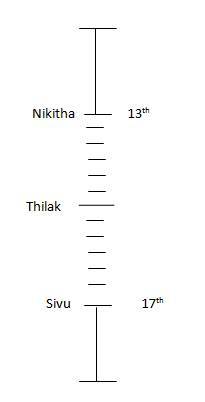 If Thilak is sixth rank after Nikitha and just in the middle of Nikitha and Sivu then how many students are in the class? Q.19) In a row of boys Ramesh is 15th from the right end. Arjun is 24rd form the left end. Bala is standing exactly between the two boys. How may boys in the row. Q.20) In a row of boys Chandru and Surendar occupy the 13th from the right and 17th place from the left end, respectively. If they interchanged their places, then Chandru occupy 21st from the right end. How many boys are there in the row?